Barbara Rudolph Fine Art: Chickadee Painting - "Waiting For A Song"
Chickadee Painting - "Waiting For A Song"
This is a new mini oil painting of a little "chickadee" sitting on a tree branch. There is something wonderful about "chickadees". They are so cute with round heads and little bodies. They are curious about everything. We unfortunately don't have them where I live, so I cannot speak from personal experience, however they were one of my late father's favorite subjects to carve. The "chickadee" has a black cap and bib, with white cheeks and gray black wings and tail. They also have a whitish underside with buff colored sides. "Chickadees" have a habit of investigating people and everything around their homes. 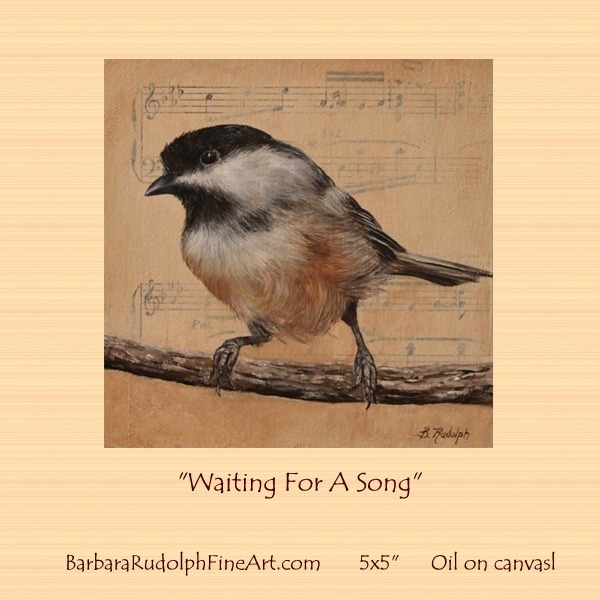 This little "bird" was painted over an antique "sheet of music" that I embedded into my canvas. 5"x 5" oil on canvas. It will be available at the next "Celebration of Fine Art" show in January.